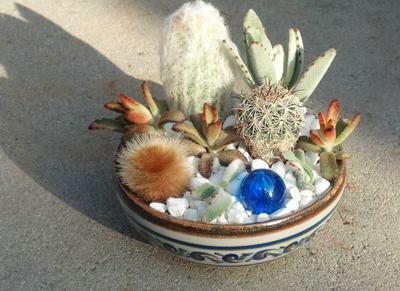 A preserved cactus husk and a blue plastic ball add appealing round shapes to this plant-packed design. A tiny vintage porcelain basket perfectly matches its contents! Fabulous plumage for a fabulous bird! 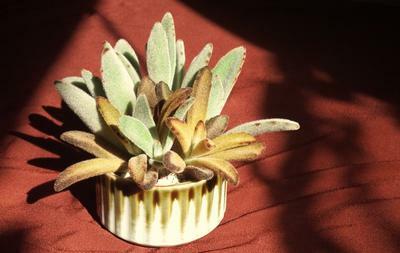 Warm fuzzy kalanchoes make a lovely fall centerpiece. 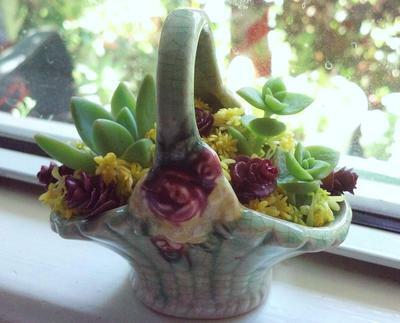 My designs are made with love.. and very little money - thrift stores and cuttings go a LONG WAY! I like to put designs together in any price range. Colorful containers are paired with contrasting or complementary succulents. Either I match them perfectly, mirror them just a little, or contrast them completely. My cuttings and mama plants are always growing, just waiting to be snipped and tucked into something cute. I let the container speak to me. I wish more containers would speak up lately, sheesh! They've been too quiet and I'm jonesing to make something new! What about drainage? Do the containers have to have a drainage hole or do you put rocks in the bottom? 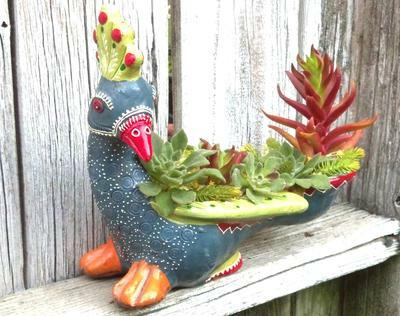 Return to Best Succulent Container Contest 2013.